Jun 6th A great beginning to a new summer! Hi there from Baker’s Biochar! It’s a new summer and we are thrilled to get up and running! Just a quick refresh about our Biochar. It’s made with wood we get from a local sawmill then, it’s processed in a oxygen deprived environment where it is transformed into the Biochar. We grind it in a antique belt operated hammer mill and it’s mixed 50-50 with high grade compost for inoculation. Then it is packaged in reusable and always recyclable buckets available at our product page. It can to be sent to you or come on out to the farm and pick it up yourself! We are so excited to meet people, get to know our community and spread our love for Biochar! We look forward to hear from you and all your questions and comments! Posted in Uncategorized by Joe Baker with no comments yet. Here’s a quick video of the retort in action. Posted in Uncategorized and tagged agrichar, carbon sequestration by Joe Baker with no comments yet. We have put biochar out for the chickens in two ways, both of which they seem to like. One way is to mix it into their feed. There are never leftovers, unless there are pieces too big for them in the mix. The other way is free choice, either in a separate feeder or sprinkled directly onto clean bedding. Chicks line up on the char, scratching, pecking, and generally enjoying a party of sorts. So why give chickens Biochar? Well when you feed the Biochar to your chickens it will actually inoculate inside them. Biochar acts as a sponge for all the good bacteria, vitamins, and minerals in an animal’s system. All those nutrients end up in their manure which is exactly what you need for good healthy soil. Ever heard of Coccidiosis? 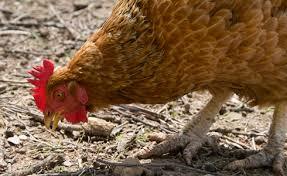 Coccidiosis is a parasite that attacks an animals intestinal lining and damages it leading to a slow painful death. Animals that have this disease cease to thrive or grow right, become pale and listless and bloody diarrhea follows. This parasite is easily spread and can come from other infested flocks, birds in the wild and even by us humans stepping in their poo and taking it with us. Let’s just say not something you want hanging out at your farm.When chickens ingest Biochar it absorbs that bad bacteria/parasite and dispels it. Even if your flock doesn’t have this or any other disease, supplementing them with Biochar is a great preventive against a kind that might fly your way. Even though it was rainy and breezy, several brave and curious souls arrived at the biochar seminar last Saturday.Baker’s Biochar sponsored Peter Hirst as the first presenter at our on farm biochar seminar. Peter is one of the foremost proponents of biochar in the United States. He demonstrated the concepts of pyrolisis, using a few different sizes of burners. One of the most simple was a “TLUD”. It uses the concept of a top down fire, based on the fact that hot air rises, but heat radiates. Made with a paint can and a few food cans, small amounts of biochar are easy to produce. Peter also used the burner we’ve been learning with, the “fat man”, to demonstrate a larger scale retort. What is biochar good for? What’s the hype all about? Peter discussed the amazing things biochar does in the soil. Biochar is, essentially, an empty apartment house for the flora, fauna, and minerals in the soil. When mixed with compost and other amendments prior to application, it will store the nutrients and microbiology of the compost and then make it available slowly (over the course of years) to the plants. This has the effect of providing a nutrient bank for the plants and critters such that one application will enrich the dirt immediately and long term. We learned in conversation that that bank can be refilled, much like your bank account. Instead of allowing nutrients to run off into where you don’t want them, the char will hold them in place and pick up more nutrients as the plants pull out what is stored. Biochar will also hold moisture, helping to keep crops moist during dry times. As a side benefit, biochar is a pure carbon product that is being returned to the soil instead of returned to the atmosphere. In the process of a tree’s death and decomposition, CO2 is released back into the atmosphere. This process helps to sequester that carbon and return it back into the earth to benefit the life there. Another frequently asked question that Peter addressed was to compare charcoal and ashes to biochar. The simple answer is that charcoal is produced at lower temperatures and therefore still contains many of the tars and gasses that are later released to give your food that wood flavor. Biochar is made at much higher temperatures and is void of the tars and gasses, leaving more room for storage. Biochar is somewhat comparable to activated charcoal. The biggest difference is that activated charcoal is heated even higher than biochar, producing even greater storage capacity and more purity so that smaller amounts can be highly effective. For its purposes, biochar is more cost effective than producing activated charcoal for your soil. We look forward to having Peter out again and learning more about biochar’s possibilities.